Lightning struck near an Atascadero house, then traveled through electrical wiring into the garage, setting the 4600 San Vicente Avenue home on fire Wednesday morning. No one suffered any injuries as a result of the lightning strike or the fire. Firefighters contained the blazed within 25 minutes of arrival, according to the Atascadero Fire Department. Smoke was coming out of the garage when firefighters arrived shortly after 7:23 a.m. Firefighters then entered the garage and found some of the owner’s belongings on fire. Fire crews extinguished the blaze before it spread to the main part of the home. Officials estimate the fire caused about $3,500 in damage. 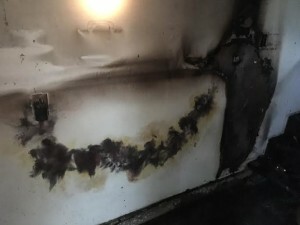 It is not known how much structural damage the lightning strike caused to the electrical wiring. If you have above ground power lines coming into your house it is a great idea to install a whole house surge protector. That will block the huge electrical surge from a lightening strike or a transformer failure from entering the electrical system and causing damage. Lightening rods are recommended if your house is on high ground or have projections like chimneys sticking far above the roof line. A whole house surge protector would have done nothing in this case. It protects only against utility over-voltage. A lighting strike on or near a building is on the other side of the surge protector. Wow. What is the chance of that? Better chance than winning the lottery.